Join us at the #SDMBeautyGala Twitter Party and support Women’s Cancer Programs! With all this warm weather we’ve had lately, isn’t it time to celebrate? 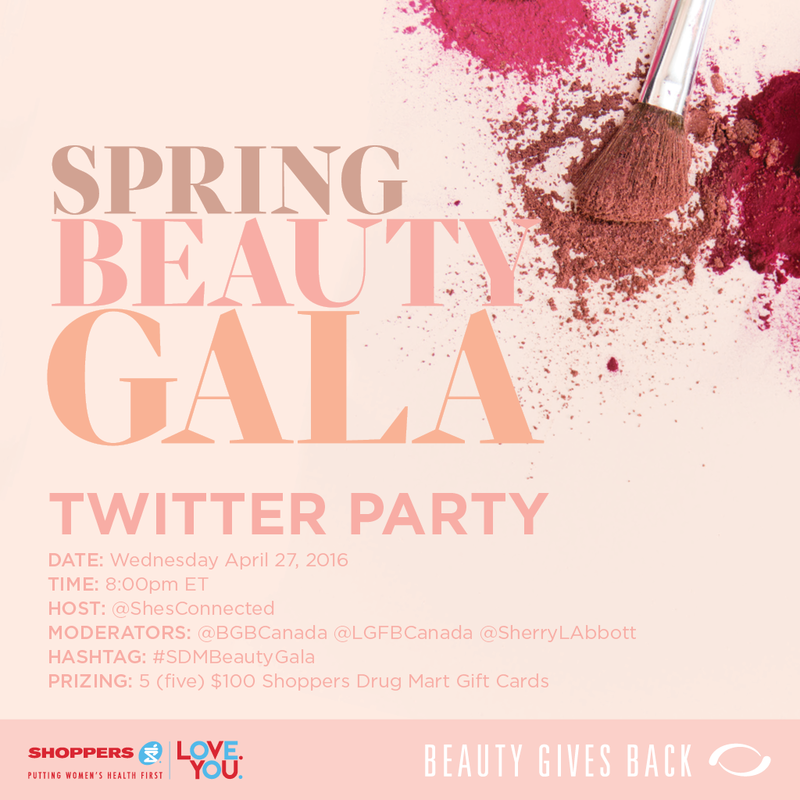 On April 30th, the fine folks at Shopper’s Drug Mart are throwing an in-story Spring Beauty Gala to celebrate spring! In stores across the country, gala guests will enjoy complementary makeovers, skincare consultations, free samples, refreshments and snacks. How great is that? Even better – funds raised go to a good cause! What’s better than shopping for a good cause (other than your own wardrobe!) Funds raised at locations in the Prairies and Atlantic Canada will benefit Beauty Gives Back, a charitable initiative of the Canadian beauty industry, dedicated to helping women beat the Cancer Blues. How can you attend? Just swing by your local Shopper’s Drug Mart and talk to a beauty expert to get your ticket! Tickets are only $10 – and the best part? $5 of the ticket is donated to a charitable organization. The remaining $5 is redeemable on any purchase made at Shoppers Drug Mart during the event! Look Good Feel Better is Canada’s only charitable cancer program dedicated to empowering women to manage the effects that cancer and its treatment can have on their appearance. At the heart of Look Good Feel Better is the free, 2 hour hands-on workshop offered at 120 cancer care facilities and hospitals across the country. Since its inception, it is estimated that Look Good Feel Better has helped hundreds of thousands of women across the country. What is the Cancer Blues? It’s a term for the emotional distress caused by cancer and its treatment. The Cancer Blues is a huge and overlooked part of the cancer story. For the majority of women, a cancer diagnosis unleashes as many emotional symptoms as physical ones.
. Visit http://www.beautygivesback.ca/ to learn more about this great cause! Save the Date! April 27th at 8pm is our Twitter Party, where you can join us to learn more about this fab event and the great cause it benefits! Hey Buddy!, I found this information for you: "Join us at the #SDMBeautyGala Twitter Party and support Women’s Cancer Programs!". Here is the website link: http://shesinfluential.com/2016/04/20/750/. Thank you.